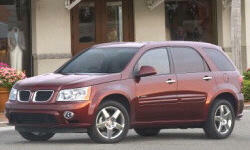 Pontiac Torrent Pros and Cons | Page 1 of 1 | Why Not This Car? What drives people to buy (or not buy) a certain car? TrueDelta's members share Pontiac Torrent pros and cons based on their real-world driving experiences. I like the Torrents color (burgandy) it is pretty. The rear seat slides for and aft making for lots of leg room or more cargo space when you need it. I also like the center armrest and upright position. Bought the torrent in anticipation of starting a family and needing the room for car seats along with cargo meant for our camping trips.